Richard Wagner's works for the stage, representing more than 50 years of creative life, comprise his 13 completed operas and a similar number of failed or abandoned projects. His first effort, begun when he was 13, was a prose drama, Leubald, but thereafter all his works were conceived as some form of musical drama. It has been suggested that Wagner's wish to add incidental music to Leubald, in the manner of Beethoven's treatment of Goethe's drama Egmont, may have been the initial stimulus that directed him to musical composition. 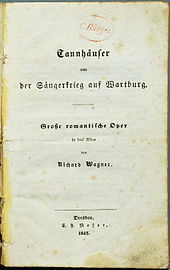 Wagner's musical education began in 1828, and a year later he was producing his earliest compositions, writing words and music, since lost, for his first opera attempt, Die Laune des Verliebten. During the subsequent decade he began several more opera projects, none of which was successful although two were completed and one was staged professionally. His first commercial success came in 1842 with Rienzi, by which time he had completed Der fliegende Holländer, in which for the first time he used the device of the leitmotiv, a characteristic that became a feature of all his later works. After accepting the post of Kapellmeister at the Dresden court of the King of Saxony in February 1843, Wagner continued to compose operas and plan various large-scale projects. His political activities forced him to flee the city in 1849, beginning a long period of exile. In Zurich, his first refuge, he wrote the essay Die Kunst und die Revolution ("Art and the Revolution"), in which he introduced the concept of Gesamtkunstwerk, or "drama-through-music". This idea was developed in the extended discourse Oper und Drama ("Opera and Drama"), 1850–51. A different form of verse-setting, which Wagner termed Versmelodie, was proposed, in which the music would grow out of the verse, this unification overriding such traditional operatic considerations as display arias written as showcases for the talents of individual singers. According to Wagner historian Robert Gutman: "The orchestra with its many tongues would take over the traditional operatic tasks of the chorus". Beginning with Das Rheingold (1853–54), the principles of Gesamtkunstwerk became the basis of all Wagner's stage work, in which, quoting Wagner chronicler Charles Osborne, "the drama presented on a conscious level by the words [...] would be pursued on a deeper, unconscious level in the orchestra." From his first attempt in the opera genre, Die Laune des Verliebten, Wagner became his own librettist and remained so throughout his creative career. His practice was to create music and text simultaneously; in biographer Robert Gutman's words: "as the music proceeded it drew forth the words." While working on Tannhäuser Wagner explained his technique in a letter, saying: "before starting to create a verse or even outline a scene, I must first feel intoxicated by the musical aroma of my subject." 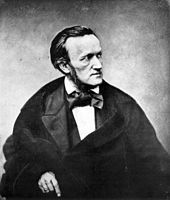 Unlike the works of many composers, those of Richard Wagner were not identified by opus numbers, and no proper attempt to create a complete catalogue was made until the 1980s. In 1983 the Wagner scholar John Deathbridge, in an article in The Musical Times, outlined the need for a reliable catalogue. Two years later, in conjunction with Martin Gech and Egon Voss, he produced Wagner-Werk-Verzeichnis, described by fellow-scholar Michael Saffle as "perhaps the single finest and most useful of all Wagner reference works." Each of Wagner's known works, whether finished or unfinished, is listed in a number sequence running from 1 to 113. The list includes all compositions and all prose drafts where the music is either lost or unwritten. English: Jesus of Nazareth Oper? ^ "Stage festival play, preliminary evening"
^ "Stage festival play, second day"
^ "Stage festival play, third day"
^ "Comedy in antique style"
^ "Consecrated stage festival play"
^ Advertised as the "British premiere", there is no record of a public performance anywhere before this British adaptation.